Bespeaks the land of Jameson’s and Guinness. Of Charles Peterson’s crowning achievement. Its well-form’d bowl of aged briar yields. In Sallynoggin does my heart repose. And if you love mystique of Peterson pipes but haven’t really figured out the ingenious design of the System yet, check out the post Adam O’Neill did with me on the Pipe Lines blog at Smokingpipes.com today. 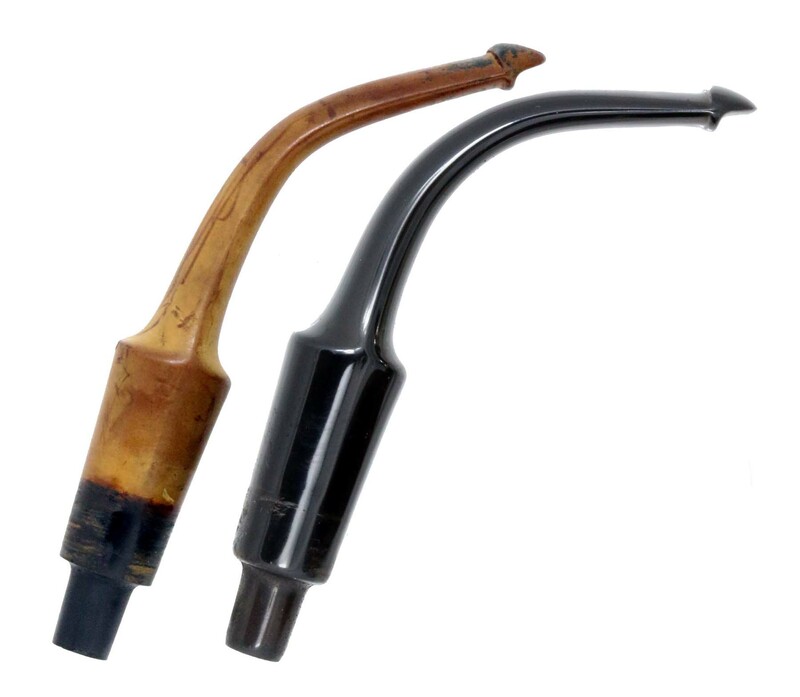 Dings, bends and loose ferrules are all common in older estate Petersons, and can often be removed without too much difficulty. The ferrule’s job isn’t primarily aesthetic, but to keep the tenon-mortise strong in the “push” (as Peterson craftsmen call the army mount style). The fit on James’s O1 is quite snug and the glue very strong. It is unusual only in the sense that I’ve never seen one mounted in such a way as the nickel marks are up front, facing the chamber rim, rather than flush to the obverse. You can see the problem at the shank face, where the ferrule has been pulled up along the edge, presumably through long use in extracting the mouthpiece, which it scarred over the years. Steve Laug has complete instructions in the Peterson book (by the way, the book is done and off to the indexer) for how to fix almost any problem with a ferrule, so you’ll have to wait for the official version. But this repair is straight-forward. I needed only to use the heat gun to heat the ferrule at the shank face, then roll it on a hard surface—in this case, my all-purpose mat board. The nickel was pushed back to the shank’s opening, and the few tiny crimps were pushed down and sanded with the judicious application of a small flat file. I can’t sand the nickel cap like I would a sterling one, as it would remove the nickel-plate (the ferrule is nickel-plated brass). But I can use rouge or Tripoli compound along the ragged edge to give it a light sanding. Before putting the ferrule on the buffing well, I applied Simichrome, my go-to silver polish, to get it as clean as possible and avoid any buffing strain on the nickel. Afterwards, aside from the nickel marks, I gave the ferrule a light buffing with white compound to remove the light surface scratches. The nickel mark area I went over lightly with a finer jeweler’s compound, Fabulustre. Some of the tiny dents couldn’t be removed, but any more use of the wheel might buff through the nickel, so these will have to stay as reminders of the pipe’s age and character. Before I go on to restaining, I’m ready to stop and clean out the air passage and sweeten the chamber. 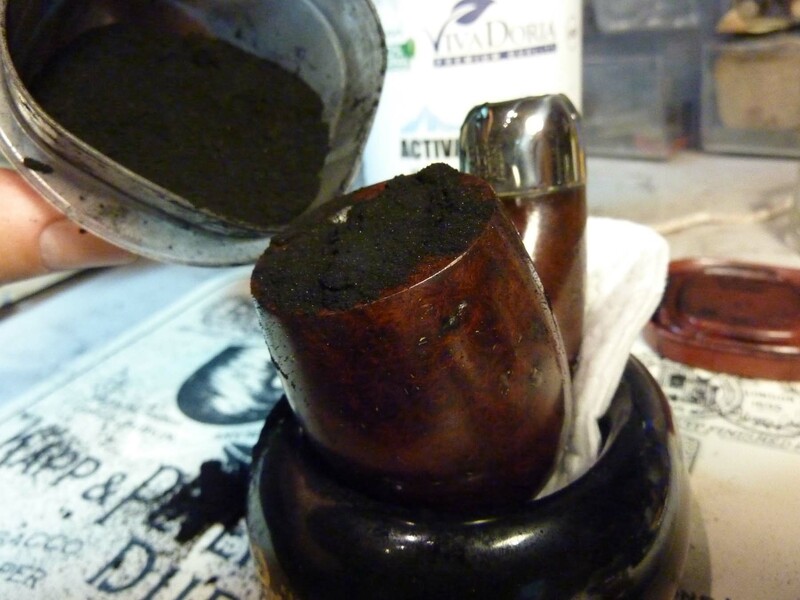 I might have just submerged the bowl, but the old briar, old putty, and bare chamber walls make the Professor’s Sweetening Method seem like the best way. When I heated the ferrule to bend down the edges, the reservoir wafted up a strong smell of latakia. I don’t know whether James smokes English or not, but a good cleaning now will allow him to decide what he wants to smoke without the fear of ghosts haunting the bowl. You can see in the photo below that tars saturate the reservoir of a System much more intensely than its chamber. As Steve Laug has often noted, you can match virtually any stain with just a few bottles of Fiebing’s. In my Peterson work, I routinely use medium brown, burgundy, black and orange. 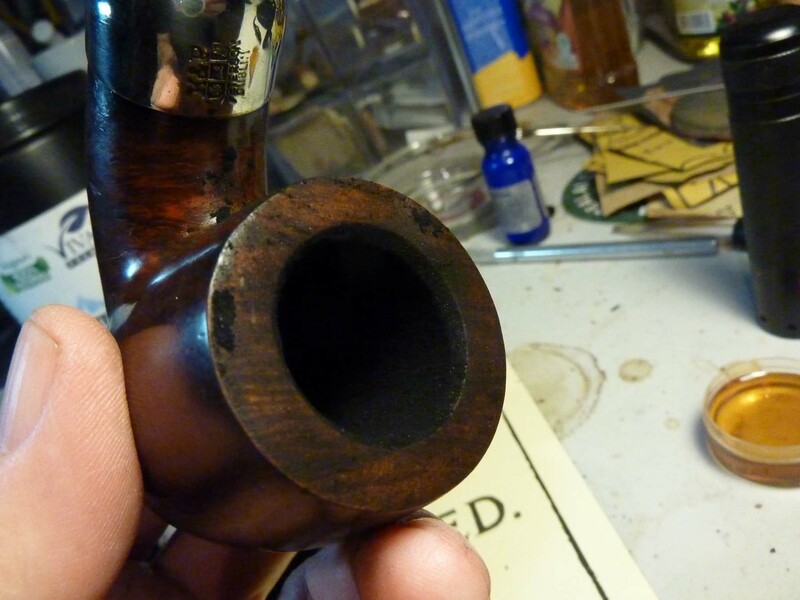 Crown: At the factory, the pipe had been given a typical Peterson contrast stain: first, black over the entire bowl to bring out the grain, then the top stain, in this case a medium brown with just a bare hint of red in it. To bring the unstained crown into a sustainable finish aligned with the rest of the bowl, I applied a coat of isopropyl-diluted Fiebing’s black aniline dye to the top (fairly weak), wiped it with a cotton pad, reapplied, and burned it in while wet. I then repeated this operation a second time. Afterwards, the crown was sanded not with a Micromesh pad, but with a flat piece of cloth Micromesh so as not to round the corners I have been at such great pains to sharpen. The rim is now ready to restain with the rest of the bowl. Bowl: What seems to have been original color, as I said, was brown with a bare hint of red. So that’s what I mixed up: 1 drop of burgundy with about 5-6 drops of medium brown in a tiny cup filled with alcohol. I just do tiny batches, enough to treat the bowl with the Fiebing’s applicator. I didn’t burn in the stain (except on the rim), just applying, wiping off with an alcohol pad and making sure it’s uniform. My experience has been that burning in the stain clouds the grain underneath, so if you want the grain to show, don’t burn. This was one of the yellowest stems I’ve ever seen. In good condition, overall, just extraordinarily oxidized. I soaked it overnight in Oxyclean, then stopped to compare the bend to those seen in the 1896 and 1906 catalogs. It might have had this slight a bend, but bends like this aren’t typically seen until decades later, and I’d like it to look as close as possible to its period. 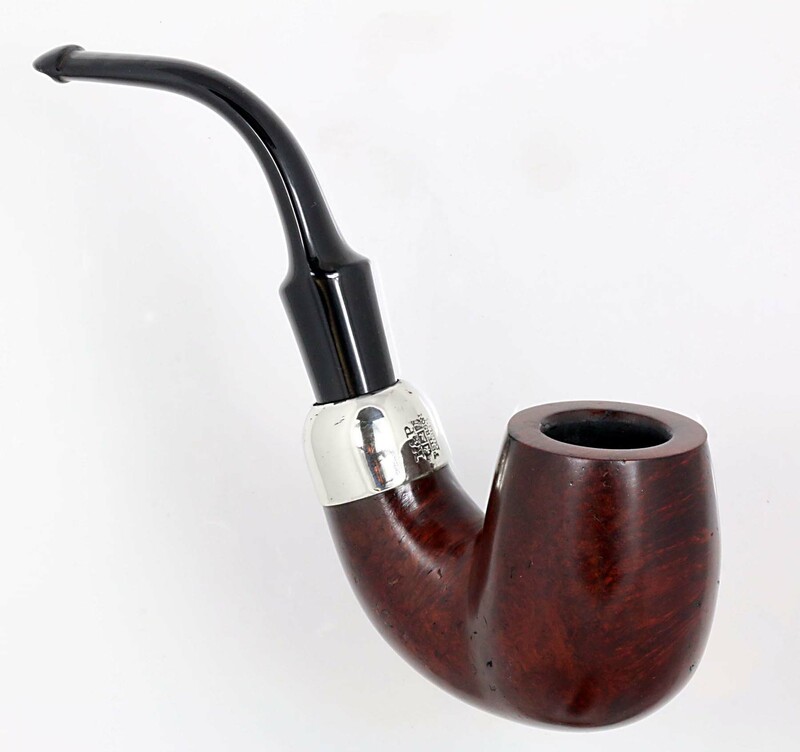 After some thought, given that I believe this is a late Patent-era pipe, I heated the mouthpiece over the heat gun, and brought down the mouthpiece end just a little to bring it into alignment of what would have been typical for the era. After the slight re-bending, I gave it 30 minutes in a bleach dip, as I haven’t been persuaded there is any other way to get through the oxidation to the black vulcanite underneath. The air hole wasn’t clogged, but was full of tars, as the Oxyclean soak and the bleach dip both confirmed. 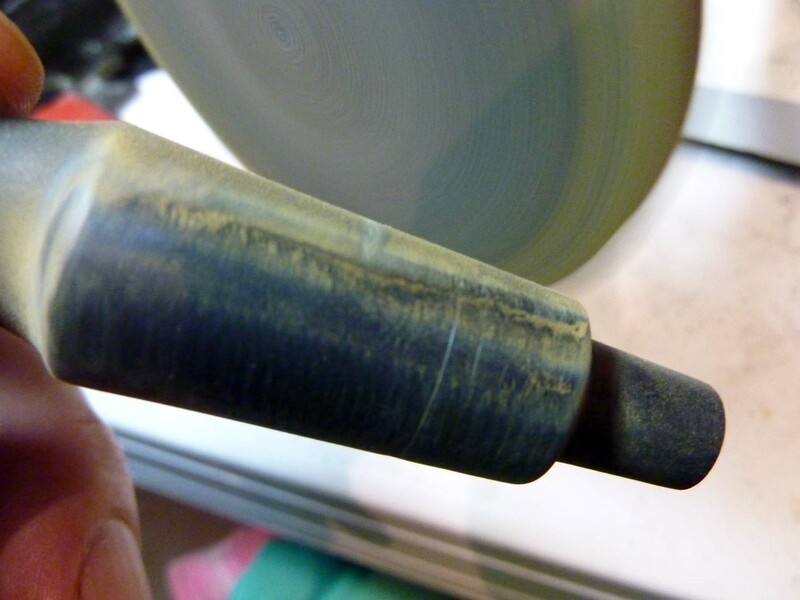 Cutting through such thick oxidation is always a trial for me, and I’ve learned over the past several months I can do more with less strain if I use a 500-grit sanding pad on my Foredom lathe at low rpms. The low rpms give me a chance to see what’s being cut and not take off anything but the surface oxidation. And as you can see in the before and after photo above, it worked. 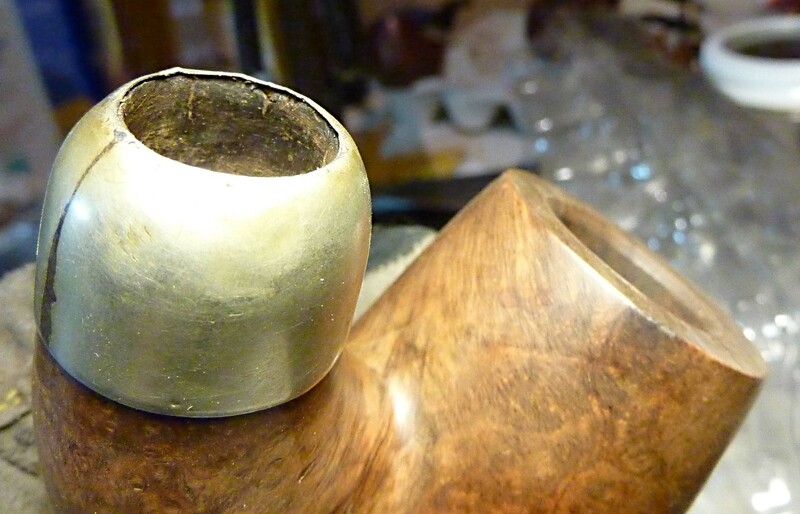 If I had more experience, I might have risked taking the scarred grooves off the tenon-end of the mouthpiece. These were caused over time by the raised ferrule mentioned above. 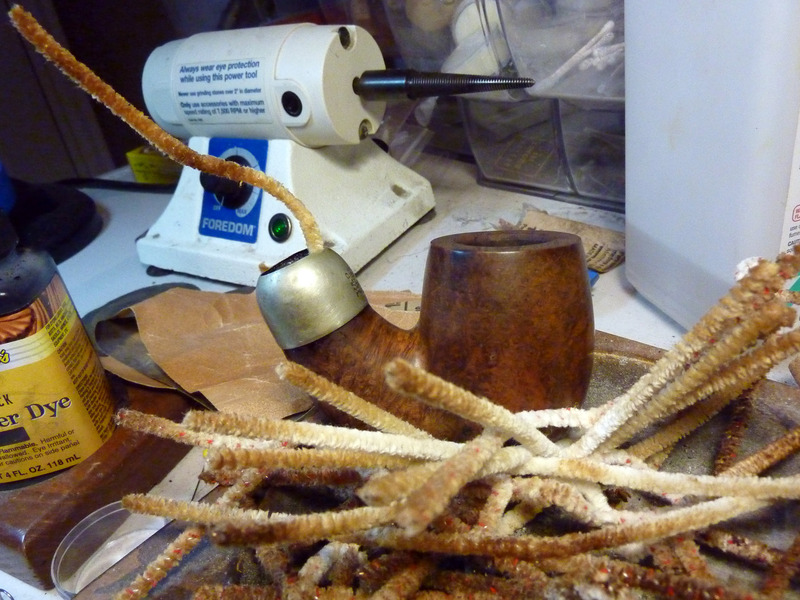 They don’t show when the mouthpiece is inserted into the mortise, and I was afraid that by cutting deeply enough to remove them, I would make the shaft too narrow and the stem wouldn’t seat properly. At this point, I took a page from Charles Lemon’s book and used just a little white compound on the bowl. On top of the 2000 grit-sanded surface, I’m in hopes the compound will provide a bit of a finish underneath the carnauba. Most burnouts, as one knowledgeable estate dealer told me, stem from (1) chuffing pipers who haven’t learned to sip their smoke (yes, I plead guilty, although I’ve learned how to sip in recent years); (2) those who break in their pipes with hotter-burning tobaccos (Virginias and vapers); and (3) really old briar which may not have been smoked in recent years. 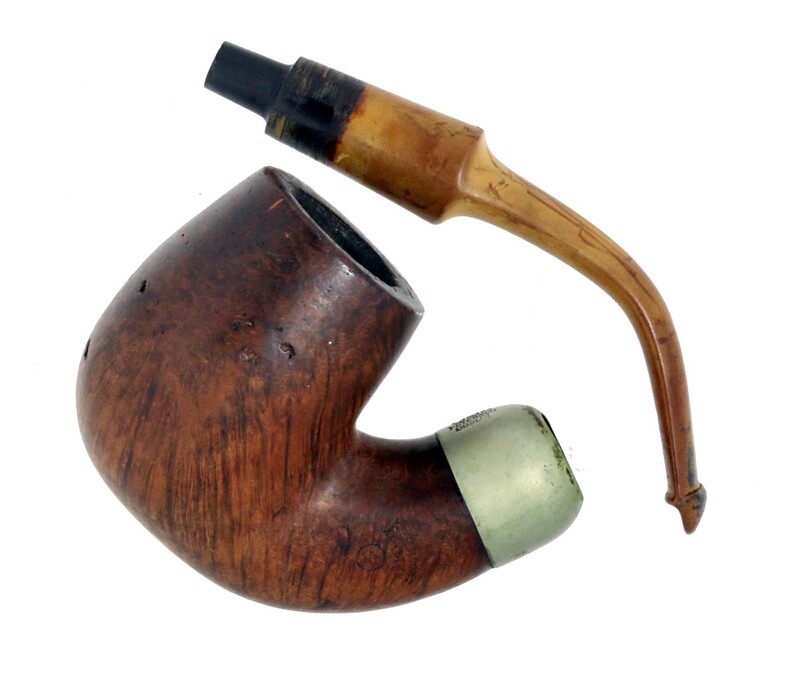 To give the pipe a little insurance against such a catastrophe, Charles Lemon at Dad’s Pipes offers my fourth and final take-away: apply a pre-carbon coating made of activated charcoal powder with maple syrup as the binder. You can read about it here. I’ve used Charles’s method on four Petes now, and can attest to the fact that it not only works, but tastes better than any I’ve ever experienced. Commercial pipe-makers use various products, and some taste downright nasty. 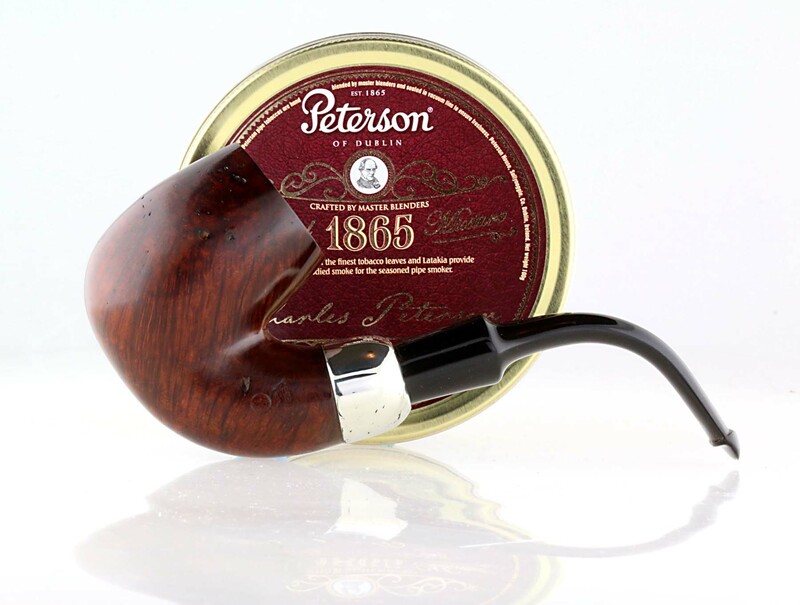 For the past 15 or so years, Peterson has used a good one, a vegetable-based paint-like substance, but not as good as Charles’s. His cake has virtually no taste, just a kind of clean sensation, and lets the flavors of the tobacco safely shine through from the first smoke. 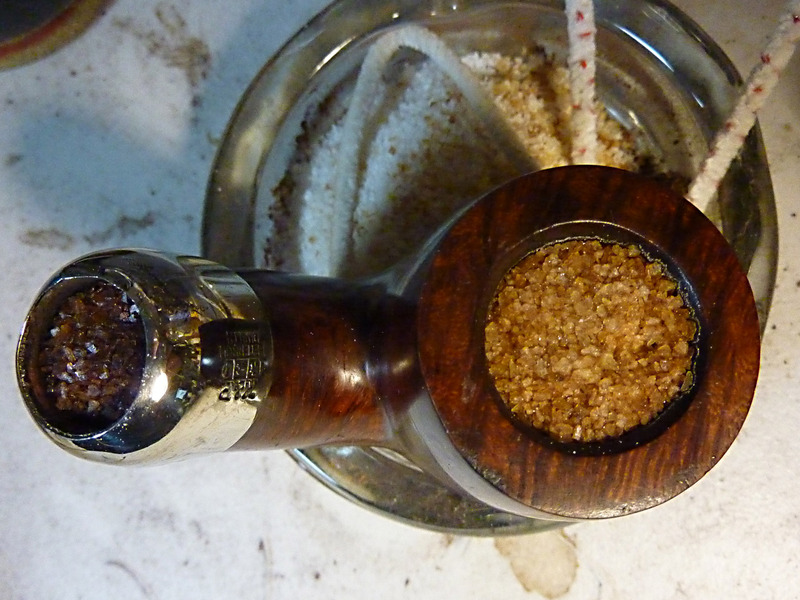 Moreover, his pre-carbon has done its work in 2-3 bowls, unlike commercial offerings that seem to take forever. The method is simple: dip your finger in maple syrup (don’t let your wife see you do this if you dip directly from the bottle!) and thoroughly coat the inside of the bowl. 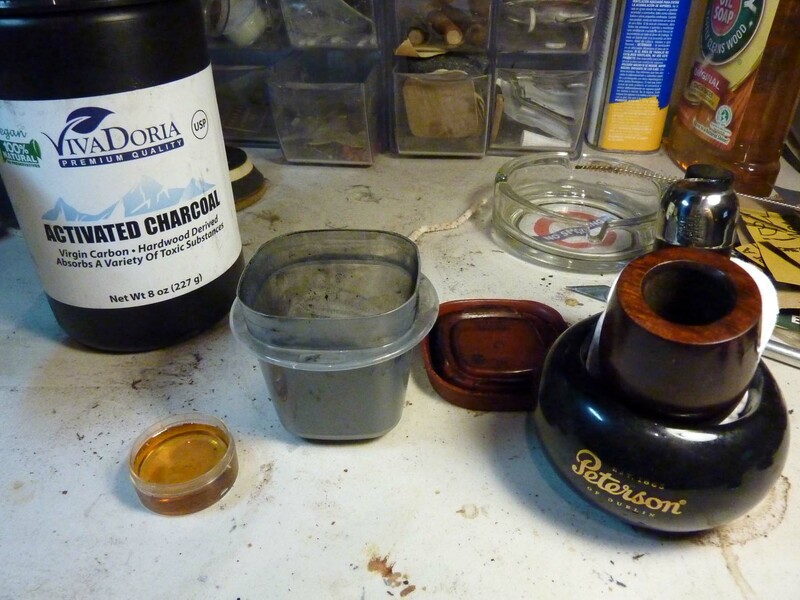 Then fill the bowl completely with activated charcoal powder and let it set for a minute or two. Turn the bowl upside down to empty out the charcoal and let the bowl sit to dry for a few days. Before smoking for the first time, gently blow out any residue (you might want to shield your eyes here), and you’re ready to go. I’d recommend this application anytime you take the chamber back to bare wood, but it should also work well on light cake when you want a little extra protection as you break in an estate. If anything, it will just absorb the tars in the cake underneath and help the pipe smoke sweeter. Of course, James will want to pay attention to the heat of the bowl and flavor of the smoke as he’s breaking it in, but there’s a little more insurance now. That’s a Mighty System, Jorgen. From you, I expect no less. Happy 120! Hope you had a good System 120 Day, Tom! Great job, Mark, and a very interesting write-up! Thanks for the kind words about my bowl coating method. It’s the only one I’ve ever used, so it’s nice to get feedback from those with wider experience with different coatings. Well, thanks for all your tips, hints, and know-how, Charles. I wish I’d had your bowl coating method 20 years ago. It would’ve saved a lot of my pipes. Thoroughly enjoyed reading this informative post….Thank you. 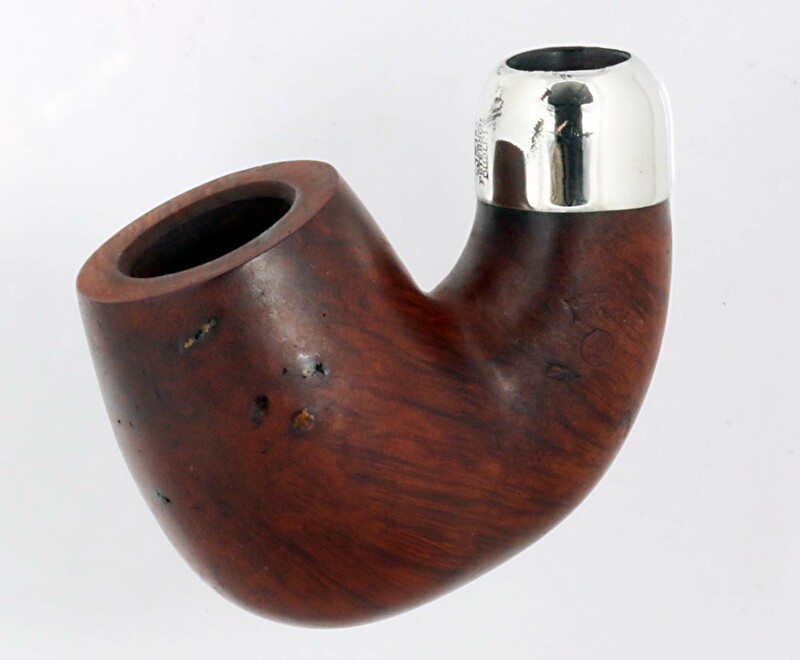 Here is the second installment on that Late Patent-Era House Pipe. Mark did a great job on the resto of this one. Give it a read today. Mark, just finishing up my first 2 1/2 hr. bowl in this majestic beauty to celebrate the day. I filled it with Sherlock Holmes but left the pack looser than normal because I didn’t want a 4 hr. smoke, which it might have been ! I was very careful with the sipping cadence and it smoked liike a dream : sweet, cool, and dry. Thanks again for the masterful work. I know I shall enjoy this often over the years, and when I shuffle off this coil I will be sure it is left to someone who will treasure it as well. Happy 120th, James! I’m so glad it smokes well. Stayed tuned for the 9494!